Having just made new yeast cakes, I put them to good use in a batch of millet wine and rice wine following the recipe I call YE1W1 and YE2W2, as they're the first and second wines (W1, W2) listed under the first exceptional yeast cakes (YE1). They came out really good! This volume will fit in a 1 gallon wide-mouthed fermenter, barely. ¼ cup powdered exceptional yeast cakes, about one cake. But do measure. Dry the yeast cakes completely and scrub them clean several times. Grate, and then grind the yeast cakes in a mortar. Soak them in 1.25 cups water for three days until they start to bubble. Add to your fermenter. Thoroughly rinse and then soak ¾ cups of dry grain in water overnight. 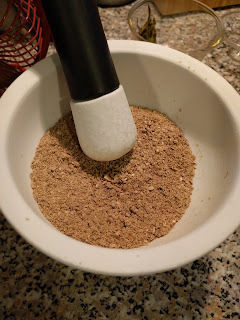 If using millet, polish it in a food processor first. Steam the millet for 20 minutes, lining your steamer with cheesecloth. Spread the millet to cool. When cool, steam for another 20 minutes. The millet should be fully cooked. Steam the rice just until steam comes out of the steamer. Cover the rice with boiling water. Spread the grain to cool, and then add to the fermenter. Possibly add extra water, no more than just to cover the grain. If using millet, three days later repeat steps 3-8 with 300mL of grain. The mash will take a few weeks to ferment. Wait until all the floating grains (“ants” in period) settle. Transfer it into a cheesecloth or strainer bag and press it to extract the wine. You can use your hands, or a board in a trough. To use your hands, twist the bag and massage the mash. Fully pressed mash is about the consistency of cooked cornmeal. Optionally filter a second time through densely-woven silk. Transfer to a closed container, let settle, and then decant and bottle. 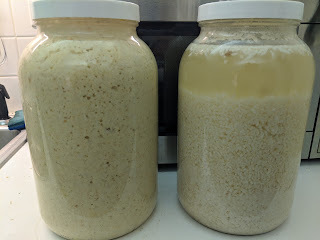 This worked much better than in the past because I polished the millet, because I added enough water to let the millet ferment, and because I'm using wide-mouthed gallon jars which let me ferment on the grain for weeks. This makes a huge difference. 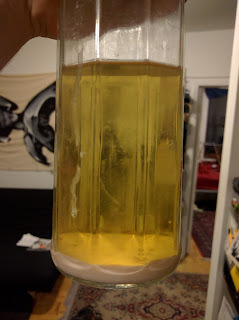 I'm pretty sure I wasn't letting any of my past batches actually ferment to completion before pressing them, leaving them sour because a lot of the starch got left behind and not turned to sugar. The floating rice grains on the right are the logs or the ants, and there's a thin foam floating with them. I would have liked to wait until it was fully settled, but Pennsic calls and I'm heading off. So I pressed the wine, filtered it, put it back in the fermenter and chilled overnight to settle out what sediment I could, and then bottled it. The rice pressed easily and filtering through silk wasn't awful. The millet, not so much. Again, I had to deal with a lot of small grain bits that gave it a pancake-batter feel, and fouled the silk repeatedly so I had to stop filtering and wash out my cloth. 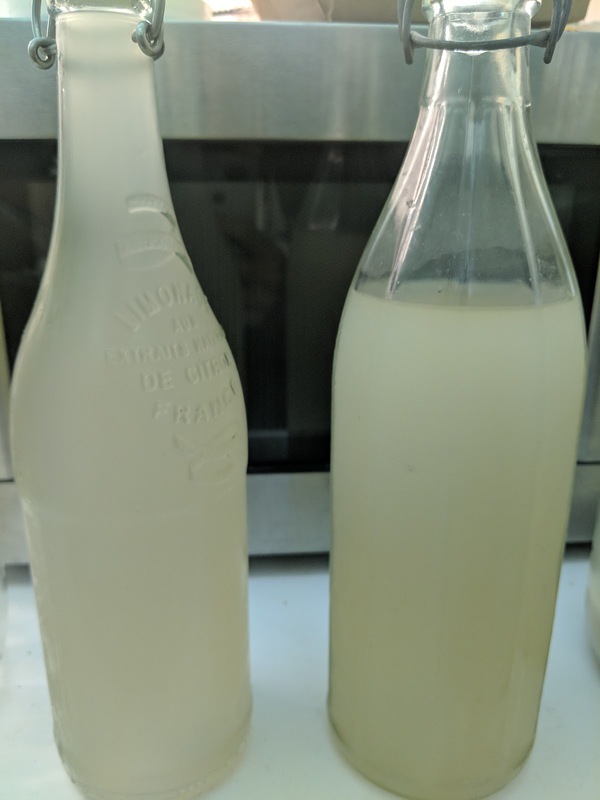 I got 3 wine bottles worth of the rice wine, but only one of the millet. No wonder millet fell out of favor! 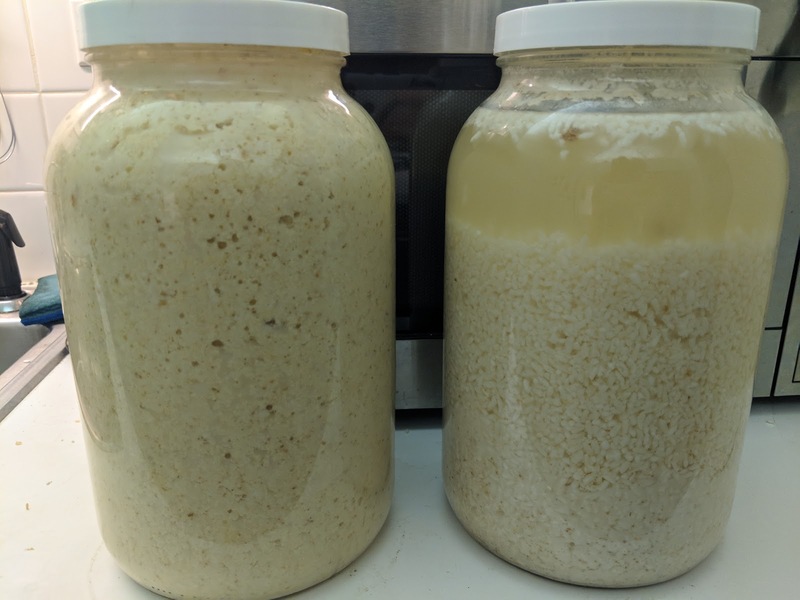 I suspect that with more water and a longer fermentation the millet, too, might digest better and not be as hard to press. Some of this is because the first round of yeast cakes had some caramelization happen during curing that leaves some color, but I think that this is more due to the millet hulls leaving color. With polishing, they're partially removed so they don't color the wine. This stuff actually tastes really good. Way, way better than older batches. As always, these are subjective. Nearly white, with a pearly cloudiness. Will probably clarify more as it sits. Mostly soured grain notes with some nuttiness and a bit of alcohol. Lightly sour but not overly so. Balanced with a faint sweetness and a medium-light mouthfeel. White with a milkly cloudiness. Also will probably clarify more. Pears! Some alcoholic notes and a hint of grain. Pear notes again, mixed with some sake character. I really like the rice wine. Catch me at Pennsic for a taste! My class is Tuesday at 2:00 in A&S 12. With the success of my firsttwo thirst-waters, I wanted to follow up on the rest of them from The Compendium of Essential Arts for Family Living. 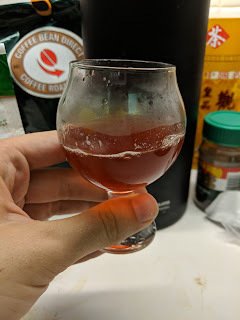 I made the first one, which was really a short mead (and reused the spices and yeast to make a very nice plausibly-historical metheglin), but that leaves six thirst-waters to try: Malus asiatica, Chinese strawberry, Chinese quince, five-flavor [berry], grape, and fragrant sugar. Chinese quinces are pretty hard to get, and the fragrant sugar one has some pretty unclear bits. I can get grape juice, but getting Vitis vinifera, the European grape, is rough in the summer: American grapes make up most commercial grape juice, and they have a really distinctive flavor that wouldn't be appropriate for Chinese grapes, which would be vinifera. I was asked by to translate some of the food recipes in Qimin Yaoshu by some SCA colleagues, so I thought I'd share them. I'm hoping they'll give me cooking and tasting notes, which of course I'll share here. It's worth pointing out that this book is from northern China, and probably has a fair amount of barbarian influence on the cooking, hence all the sheep (or goat, they're the same word) meat. There are quantities here that I should explain before we dive in. I've been a bad blogger, and neglected to post for some time for life reasons. I brought this wine to the King and Queens' Arts and Sciences competition and did very well! They included me in the second round of judging but I backed out because winning carried a bit of a burden with it that I did not want to shoulder. Thankfully, this recipe is attributed to a person, so I can name it something better than "Millet Wine and Rice Wine from Exceptional Yeast Cakes #1." (YE1W1 and YE1W2 for those playing along at home) No idea who Yuán Púshè was though. If you have one unit of powdered yeast cakes, on successive days add 3 units, 5 units, and 10 units of your grain of choice. If using millet add another 3 units on the next day.